All people – including Global Southerners, including the colonized, including the enslaved – have an innate interest in being free. Therefore, all people – including Global Southerners, including the colonized, including the enslaved – will oppose conditions that limit their freedom. These sentences probably seem trivial to most readers. Of course people desire freedom, and of course that desire is not contingent on their status as a racialized, colonized, or enslaved person. But these sentences have not always been trivial. In fact, much of the subjugation faced by those in the Global South and by the enslaved has relied on a history of justifications in colonial political thought – some of which I have outlined in my previous piece, “Critique of Imperial Reason.” And this stream of thought relied on the notion that racialized people, particularly those in the Global South, were not naturally constituted for freedom. Instead, they were thought to be naturally constituted for subordination, and were further thought to lack the rational capacities to be free. Because of this, most of what we knew about this set of people – which I will, like other theorists before me, refer to as the “subaltern” – did not come from their own accounts of their experiences. Instead, they came from elites that were intent on documenting the subaltern as hostile and uncivilized. In recent history, postcolonial scholars have sought to make a claim we might now consider to be very basic: the subaltern are rational agents that desire to control their own circumstances and live freely – just like anybody else. Scholars like Gayatri Spivak and Ranajit Guha have devoted time to highlighting how mainstream scholarship has perpetuated the notion that the subaltern are irrational and unable to speak for themselves. Spivak’s famous piece, “Can the Subaltern Speak?” points out how the subaltern have been conceived of in reductionist, simplistic terms, as have their motives. As a result, they are viewed as a homogenous, primitive unit that need Global Northerners to speak on their behalf. Guha, like Spivak, writes of this reductionism through discussing the documentation of peasant insurgency in colonial India. He argues that some scholars falsely documented the actions of Indians to be motivated solely through sectarian hatred between Hindus and Muslims, and presents counterevidence of class solidarity between the two groups against wealthy elites. On the other hand, Guha also points out that left-wing scholars were also reductive, misattributing peasant insurgency solely to class disparities without any attention to ethnic and religious complexities. Either way, Guha rightfully argues, scholars have erred by attempting to simplify the motives of Indian peasants. Spivak’s famous piece, “Can the Subaltern Speak?” points out how the subaltern have been conceived of in reductionist, simplistic terms, as have their motives. As a result, they are viewed as a homogenous, primitive unit that need Global Northerners to speak on their behalf. While Spivak’s and Guha’s contributions have lead us to rethink our perspectives on the Global South, I argued in my previous piece that racist conceptualizations of the subaltern are able to evolve and adapt to current conditions. That is, they attempt to modify themselves to subvert new critiques, while continuing to rest on the same underlying claims. This is something I notice all too frequently with the discourse on Palestine. Any perusal of The McGill Daily’s Facebook page, for instance, will reveal people commenting on any article about the Israeli occupation in ways that deride Palestinians for daring to express their grievances, laugh-reacting to the article, and claiming that the accusations made are baseless attempts to single Israel out as a state. And that’s just the surface. In The New York Times, popular columnist Bret Stephens recently chided activists for supposedly only caring about Palestinians when they could blame Israel. Such a critique implies that Palestinian activism is not really about achieving freer conditions, but about demonizing Israel. This is reductionism that baselessly ascribes bad motives to a cause propelled by vulnerable people in unsustainable conditions. People often forget that the concerns about the Israeli government’s policies regarding Palestinians do, in fact, arise from Palestinians, which makes it incoherent to complain about a “singling out.” For instance, the Israeli government has over 60 discriminatory laws against Arab minorities. Who should Palestinians complain to? If Israel claims to be democratic, the logical recourse would be to voice a grievance against the Israeli government – and not against every single other government that has violated international law. When Palestinians are forced to demolish their own homes, is it not natural to protest their conditions and express their pain on the global stage? When children are shot in the face for handing out sandwiches to demonstrators, and when people are shot for protesting – who do they express these grievances to? Is it wrong to ask the world for solidarity when you are mourning the deaths of your family at the hands of the state? Some seem to think so, though their justifications are hardly convincing. The dismissal of Palestinian grievances comes in a few forms. One form claims that they seek to destroy the world’s only Jewish state. In other words, the claim is that Palestinians that voice their grievances against Israel are motivated by anti-Semitism: a vile, age-old hatred that has subjugated one of the world’s most marginalized groups. Yet, it is to the benefit of white supremacists to treat [Palstinian grievances] as another form of savage, sectarian hatred by groups they believe to be beneath them. I have no doubt that some people invoke anti-Semitic language – either intentionally or unintentionally – to speak about Israel. White supremacy is real, and the fact that it is systemic means that the popular language used to speak about oppressed groups often has a bigoted history. But this means that everyone internalizes anti-Semitism; not just Palestinians. That is, anti-Semitism is not an exceptional feature of Palestinian and Arab communities, but a global system of oppression. To treat it as an exceptionally Arab feature is to treat it as an irrational hatred by violent people rather than an unjust way the world has organized itself for over 2,000 years. Yet, it is to the benefit of white supremacists to treat it as another form of savage, sectarian hatred by groups they believe to be beneath them. To recognize that criticisms of Israel can be anti-Semitic is very different from claiming that Palestinians are upset with Israel because it’s a Jewish state. Palestinians would be not be resigned to their conditions regardless of what kind of state was policing them and occupying them militarily. For instance, Palestinians revolted against the Ottomans for autonomy under Zahir al-’Umar, who fought for religious toleration for all minorities. The claim that Palestinians protest Israel because it’s Jewish is susceptible to Guha’s and Spivak’s anti-reductionism critique. This is because it frames the issue as a religious-sectarian conflict and buys into the trope that the subaltern fight based on age old tribal hatreds, and not because they wish to be free. But no other group of people would tolerate such subjugation. The history of political protest shows, time and time again, that no other group would tolerate living under discriminatory laws, home demolitions, and statelessness – regardless of who is in charge of facilitating it. To claim otherwise is to reproduce the notion that the subaltern are i) motivated by irrational hatred rather than a desire for freedom, or ii) lying when they claim their circumstances are unfree. Either way, we reproduce the same pernicious discourses that have damaged Global Southerners in recent colonial history. The next form of dismissal is invoking Hamas – an Islamist group that was historically bolstered by the US and Israel to counter secular nationalism. Critics will attribute all acts of Palestinian protest to Hamas, despite the fact that support for Islamism has significantly decreased in almost all Arab states, including Hamas in Palestine. 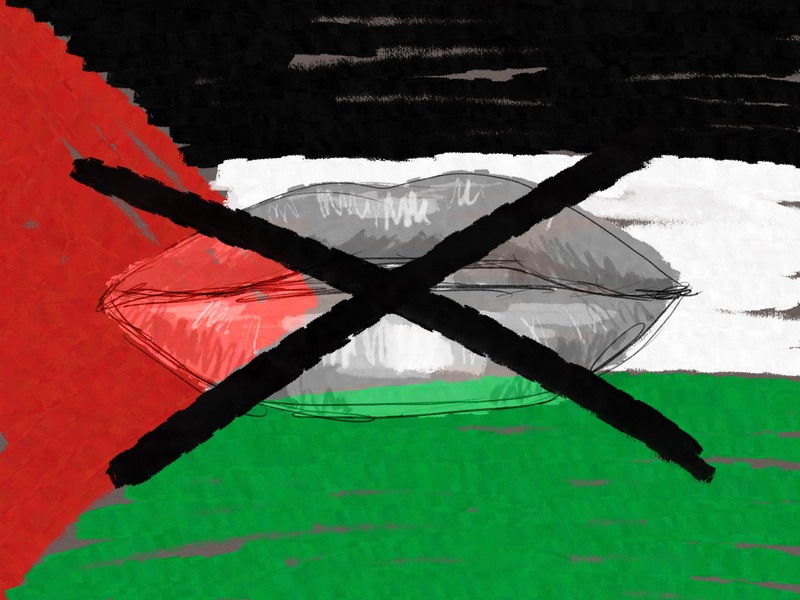 The invocation of Hamas rests on another trope that silences the subaltern. Namely, it falls back on the notion that fundamentalist irrationality drives Palestinian protests. But Palestinians’ struggle for freedom and liberation existed far before the establishment of Hamas. As Middle East politics scholars Nader Hashemi and Danny Postel have recently written, it is often elites and officials, such as those of Hamas, that weaponize ethnic and religious identities for their own benefit. They manufacture a conception of conflict that is purely sectarian and de-emphasize other crucial political grievances, such as those that would arise from socioeconomic conditions. Further, lumping Palestinians in with Hamas rests on another racist trope identified by postcolonial scholars: reductionism. That is, it treats the issue as a conflict between a civilized, democratic group of people, and a savage, fundamentalist, and uncooperative group of Islamists. Even if people have different visions as to how the state ought to look like, the issue at hand here is the reaction to Palestinian grievances. You can very easily oppose Hamas, as do many secular Palestinians, while taking the grievances Palestinians express seriously. The only way to counter historically racist ways of discussing the subaltern is to centre their experiences and their voices, rather than letting others speak for them. The only way to discuss this issue in good faith is to stop assuming Palestinians are lying about their own experiences. For it is not that the subaltern don’t speak: it is simply that you choose not to value their testimonies.